If you take time to read our previous blogs for Charter Wood you will find that these go back to 2015 when we first started writing about our activities – our work, of course, goes back a lot further to a time before blogs were invented! The blogs record similar activities except that they track our progress through the 25 acres of woodland that form Charter Wood. Matt has a management plan for the site and each season we concentrate on a different area of the woodland. The aim is to thin out the trees and provide light and space for the longer lived species and create a more open woodland structure. The wood was planted back in 1994 to celebrate the 800th anniversary of the granting of the City’s Royal Charter – thus Charter Wood. The area was quite densely planted with a variety of trees and self seeding species such as sycamore have also colonised the woodland. The hazel in the area we are managing this season has previously been coppiced but now re-grown to around 20 feet tall. Within 10 years each tree will have grown back to the same height but with a bigger stool and a larger footprint. 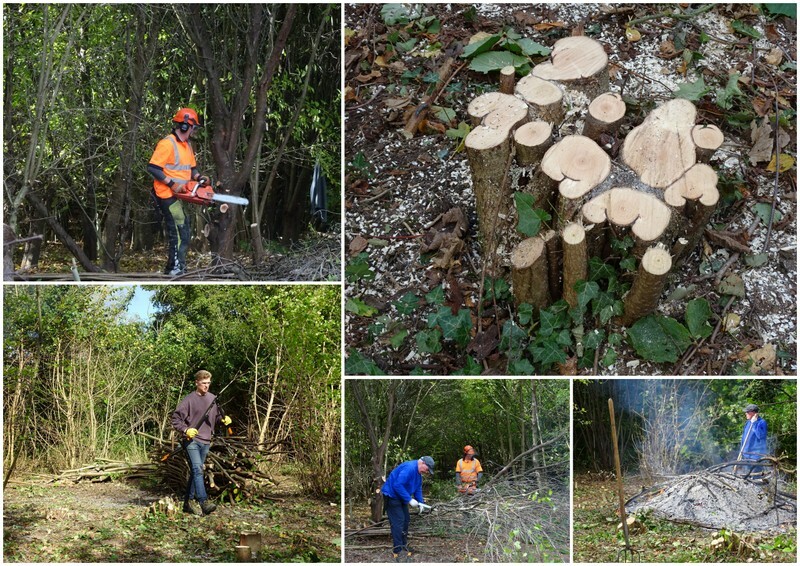 As Alan wrote last week the team coppiced a large area of hazel opening up a space large enough for a fire site. So, this week we set to work with Rob as Firemaster and others coppicing more of the hazel. However, the fire was reluctant and after a false start had to be rebuilt and re-lit. This time it stayed alight and by tea break had really got going so that we could burn last week’s brash (the leafy tops of the hazel and other trees) and also start on this week’s output. A feature of hazel is that it grows straight with few side branches and is great for poles and pea sticks which we save for use on other projects or share with other conservation groups. As always there is a lot of work to do in the wood and fortunately we had a group of around 10 volunteers out on each day. This meant that we cleared a substantial area on both days opening up a big section of the wood. Paula (Thurs) and Matt (Fri) donned their chainsaw gear and cut the larger hazel trunks and cleared trees such as sycamores which we then processed (ie cut into manageable lengths and size for the fire). Cradles were made to neatly store the cut poles and pea sticks and keep the site generally tidy. Clearing away as we work reduces trip hazards and leads to safer working. We have several new volunteers working with us as well as Pete and Pete from South Norfolk Council grounds maintenance team who are working with us as part of their apprenticeships. So, there was an opportunity for us “old hands” to share our knowledge and experience to help the newcomers and for us all to get to know each other during tea breaks. When we returned to the site on Friday morning the fire just needed a bit of a poke by Fireman Chris to burst back into life. 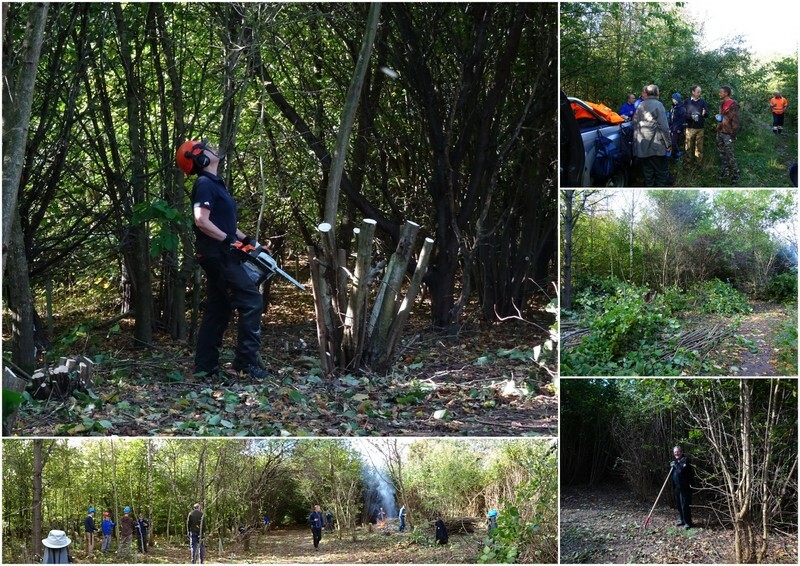 We worked steadily throughout the day cutting and clearing. Just when we thought we were packing up and had tidied the site Matt got a second wind and decided to fell a few more trees which we had to drag off the pathway so as not to block access for walkers. Processing the felled trees will be our priority when we return to Charter Wood next week.